The aquarium where you keep this fish should be large enough, because when the aquarium is too small they become more aggressive. The aquarium should be set up with lot of stone and rocks that form caves and crevices. The rocks should be firmly anchored. Some hard plants can be used for decoration as well. You should keep one male with several females. 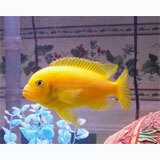 You can keep them together with other cichlids of the same size. They are omnivorous. You should give them a great variety of live, frozen and dry food. Now and then you should give them some carotene, otherwise the male looses his yellow color. Breeding is not difficult. Up to 50 eggs are laid on a flat stone. Immediately after that the female takes the eggs in her mouth. They are fertilized by the male using the dummy egg method. After 3 weeks the young fishes leave the mouth of the mother.